MIA.. i realised that i hv not been replying to all my comments and questions.. will try to do it slowly.. to those that hv emailed me... i will reply soonish yah..
Eid came and went and i know i owe some ppl my eid pics... yearly without fail i will take lots of eid pics and share it with my readers.. this year i didnt take lots... in fact i was sure i did take a few pics during our typical yearly outing but i cannot find them.. i thought i did save them but i cant find em in any of my folders.. grrr.. anyway i did however find 17 pics of my eid open hse lol.. i was very busy till the night of my open house that on the day itself i was kaput.. i managed to put a smile on my face when my guest started to arrive as early as 11:50am..
1 Cream the butter with sugar, beat for about 3 minutes mixer set at high throttle. 2 Then add the eggs in two batches after each addition mix while the mixer set on medium speed. Add flavoring and mix. 3 Mix flour with baking powder and baking soda. Add it to the butter, briefly mix. 4 Pour the coconut and raisins and mix thoroughly with a spoon (you can do this with your hands). 5 Place crushed cornflakes into a bowl. The dough is quite sticky, so use a spoon, and transfer it into a bowl of cornflakes and using your hands, push corn flakes onto the dough, mold them into balls. 6 Arrange cookies on a baking tray lined with baking paper, keeping the space between them. Bake at 170 ° C on the function of hot air for about 15-18 minutes (the up-down function at 180 ° C). Recipe is fm here... I baked it for eid and everyone liked it! 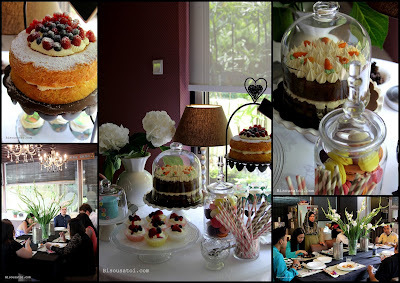 oh well.. the invitation must be lost, I couldn't find it Rima Lol - if I come, I probably will end up at dessert table only... looks so delish..